In the days leading up to the Eagles Epic Super Bowl win, Underdog fever had spread to every corner of this city. It’s even reached our actual underdogs. In a combined effort to raise awareness and combat animal cruelty, Boathouse partnered with the Pennsylvania SPCA to rally in support of Philly’s real underdogs. 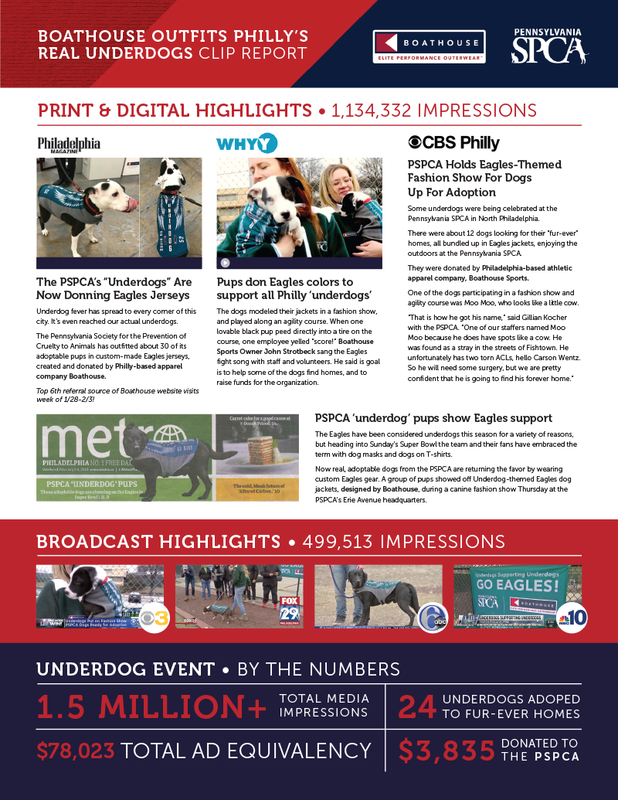 Supported by our PR agency, Braithewaite Communications, we designed and manufactured Philadelphia Eagles inspired fleece doggie jackets and held a doggie fashion show for the media at the PSPCA’s Erie Avenue headquarters. These Eagles “Underdogs” doggie jackets were in such high demand after the broadcast that we announced we would provide a limited run and make them available FOR FREE to anyone making a donation of $75 or more to the Pennsylvania SPCA. 1.5 million print and television media impressions including Philadelphia Magazine, CBS, Fox, 6ABC, NBC10, KYW3, and WHYY, which is the equivalent of about $78,000 dollars in paid advertising. Our Instagram account benefited from a very healthy jump in followers from 17,394 to 20,400 (+3,000) in only 3 days. Most importantly, however, we helped 24 pups find loving homes and the demand for our handcrafted doggie jackets have produced almost $5000 in donations to the PSPCA.